When he wasn't rocking out surf-punk style, Madan Mohan would compose some of the most mesmerizing songs ever heard in Bollywood movies. 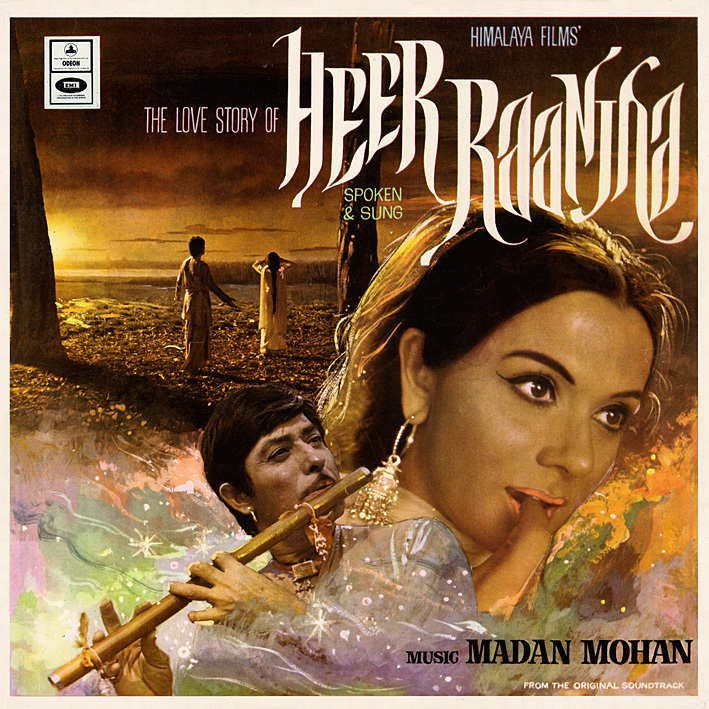 If the ones on 'Heer Raanjha' aren't quite as mind-bogglingly remarkable as his greatest moments (which would come a year or two down the line), this is nevertheless an excellent soundtrack containing plenty to savour. Both 'Meri Duniya Men' and 'Yeh Duniya Yeh Mehfil' belong to his school of atmospheric trippiness; beautiful shifting melodies, subtle backing and lush strings. 'Doli Chadhte Heer Ne Bain Kiye' too, but this one includes dramatic breaks that lend an extra bit of tension to the proceedings. There's more drama on the almost poppy sounding 'Milo Na Tum To' and 'Do Dil Toote Do Dil Hare', and 'Tere Kooche Men Tera Diwana' has so much happening it's practically an entire suite by itself. The album is a useful reminder that Bollywood soundtracks don't always have to include Western elements for me to love them. Begging the question, have I already posted Madan Mohan's best work, or are there more gems to discover? Thanks for sharing a Gem of Madan Mohan Soundtrack. I have the CD of it but always wanted to listen on Vinyl. You Must listen to DASTAK Soundtrack, The finest work of MADAN MOHASN. Other Madan Mohan Gems includes Anpadh, Hindustan Ki Kasam, Laila Majnu, Sharabi, Haqeeqat, Adalat. I've heard of Dastak but not the others. I'll keep an eye out for them, thanks. Lovin all these new ups PC! :) Thanks a lot..... About other good soundtracks from Madan Mohan, I am not sure how good this entire one is, the movie, "Anpadh" try this song https://www.youtube.com/watch?v=iGwdq0pbEWc . See if it appeals to you.